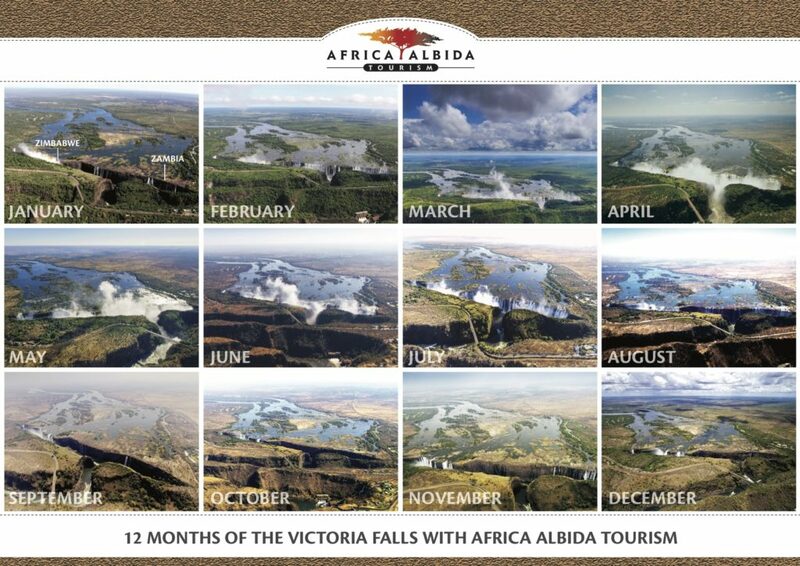 In a captivating project spanning 12 months, we have documented the changing panorama of the Victoria Falls from an aerial perspective. The project’s objective was to highlight the different levels of water in the Victoria Falls in each month of the year. Images were taken on the same day of each month, beginning in April 2016. The Zimbabwe side of the Victoria Falls is fortunate to have water throughout the year, and the images show the high-water levels of March-May and the low-water period of October-December. The collage below tells the story. Share your images of the Victoria Falls to our Facebook page, indicating the month and year in which they were taken, plus the following hashtags: #travelwithaat #VictoriaFalls #Zimbabwe, for your chance to win an amazing holiday for two at Africa Albida Tourism’s flagship property, Victoria Falls Safari Lodge, the ideal base for visits to this Natural Wonder of the World. We will choose the best image submitted, and the winner will get a two-night stay for two people in a Lodge Waterhole Facing Room on a bed and breakfast basis, plus dinner at The Boma – Dinner & Drum Show on one of the two nights, a guided tour of the Victoria Falls and a helicopter flight above the Victoria Falls (courtesy of Bonisair). Terms and Conditions apply. Thank you to Bonisair for partnering with us on this project. The prize entitles the winner to 2 consecutive nights for 2 people sharing in a Lodge Waterhole Facing Room at Victoria Falls Safari Lodge on a bed and breakfast basis, dinner at The Boma – Dinner & Drum Show on one of the two nights, a guided tour of the Victoria Falls, and a helicopter flight over the Victoria Falls. Contact Reservations to take up this prize offer on saflodge@saflodge.co.zw or +263 213 2843211 – 20. Should you wish to extend your stay or bring other people with you, please indicate this at the time of booking. The prize is valid for use between 06 January and 30 June 2018, and may not be extended. The prize may not be exchanged for cash or any other services provided by the establishment. Any extension of stay will be at the standard rates charged by the establishment. The prize may not be included in any package or any special offer which may be in existence at any time at the establishment. Transport to and from the establishment shall be the entire responsibility of the prize winner. The voucher is blocked for use over the Easter Holidays.